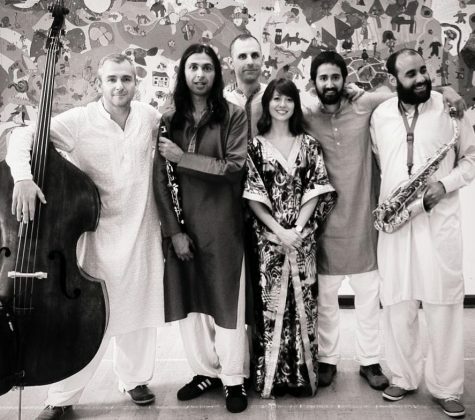 Speaking to Yazz Ahmed, I am reminded of the power of exploration of different cultures and themes in music and how this can raise awareness and inspire. The seemingly simple act of bringing your own identity to a piece of art can say so much. 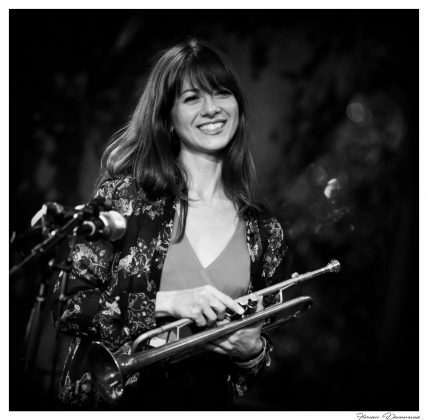 Yazz Ahmed is a British Bahraini trumpet and flugelhorn player and composer. 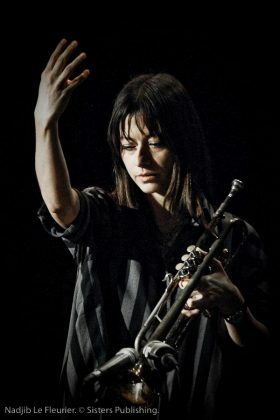 She is one of only a few ‘known’ female trumpet players and through her innovative psychedelic Arabic Jazz music, she is also one of the very few female musicians with an Arabic background. I spent some time with Yazz talking about how her heritage influences her art and her role as a female trumpet player in today’s Jazz industry. Yazz grew up in Bahrain and moved to England with her sisters when she was nine. The life style and educational differences between England and Bahrain were significant and it was in the UK that she picked up the trumpet for the first time. YA: Well, I went with the flow, but ha, you could say my vocabulary expanded – lots of words I had never heard of….and I grew up in quite a sheltered environment so there were lots of things I didn’t know about. There were sad things too, not for me so much, but my sisters experienced racial bullying. Mainly name calling and using hurtful words and that was, well you know, very confusing. But, as young children do, we adapted and just went with the flow. The school I started at in London, were offering musical instrument lessons and we were all asked what we wanted to learn, and I said the trumpet – mainly because my grandfather was a jazz trumpeter in the 1950s – Terry Brown – and I really looked up to him. I thought he was really cool and loved the music that he played to me. I think at that age, well for me and my sisters, we weren’t encouraged to like or do particular things because they were the things that girls should like. I think we were quite gender neutral. So, it didn’t seem like a weird thing to me. That may seem a bit strange, growing up in a Muslim country – I was not brought up in a stereotypical way of being brought up in that country. I think I connected with the trumpet quite early on. 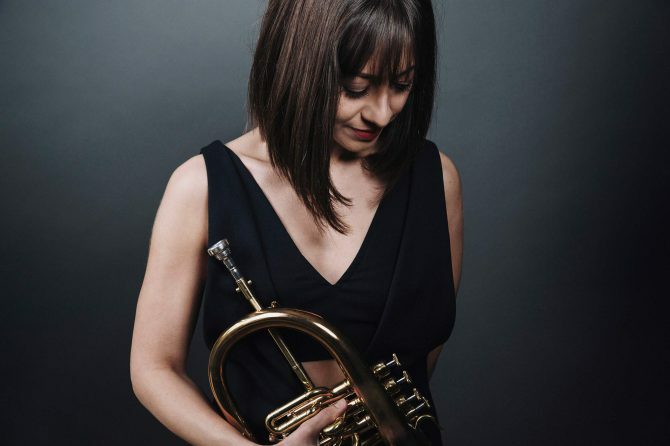 I got my first ever trumpet from the Merton Music Foundation in London and my grandfather gave me my first ever lesson – and from then on, I thought wow, this is fun! I didn’t have any dreams at that time of becoming a musician, I just really enjoyed playing, playing in a band, making music and feeling the instrument working with me – like an extension of your voice. Playing a brass instrument is very much like singing so for me, as quite a shy person, it felt like a great way to communicate with people. When I was about 16/17, I started to take music a bit more seriously and I was very into Jazz but didn’t really know much about the music and had basically taught myself. But then I had some Jazz lessons and eventually got into the Guildhall School of Music and did a Postgraduate there on the Jazz course. But there are also lots of other types of training – studying with people who are better than me, learning from others, applying different types of music – it’s all a big kaleidoscope of different things, isn’t it? Yazz is often referred to as the ‘The High Priestess of Psychedelic Arabic Jazz’ and I must admit I wasn’t initially entirely sure what Psychedelic Arabic Jazz was, but when you listen to her music, it is the perfect description. We discussed how our backgrounds and experiences shape our identity and how this reveals itself through our music. YA: I had this deep, deep feeling that something was missing, in my identity. 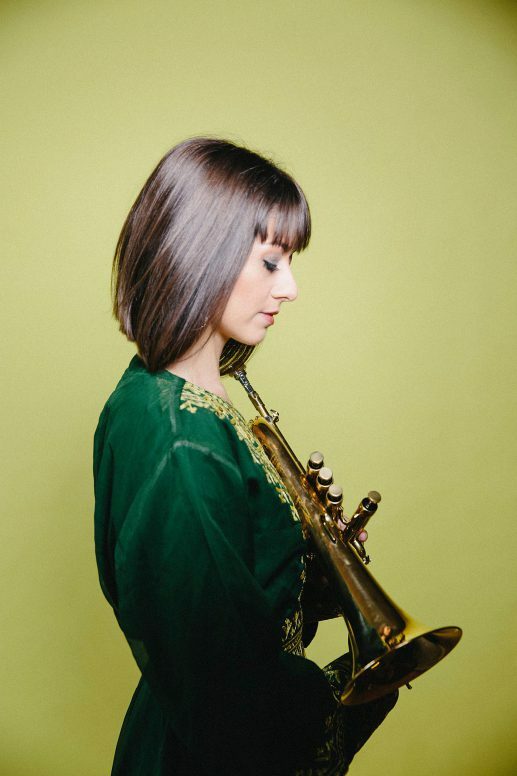 I didn’t really know what that was until I discovered this album called Blue Camel by Rabih Abou-Khalil and I only picked it up because it had my favourite trumpet player on it – Kenny Wheeler. I just started listening to it and I was instantly hooked and inspired. All this music from my childhood, growing up in Bahrain, mixing jazz flavours with Arabic music brought up lots of memories and inspired me. It made me think, oh wow, maybe I could bring my two cultures together. I suddenly felt more of a wholeness and excitement at discovering and rediscovering who I am as a person. I went to the library, took out a load of books about Arabic music and listened to loads of music. It was a real eye-opening experience for me and a new beginning in developing my personal voice. With my writing, the Arabic influence came through experimentation. I played through as many scales as possible and made decisions about which scales, and intervals really resonated with me – and the same with rhythms. I would look up rhythms and clap some out and see which ones brought up emotions and what felt really personal to me. 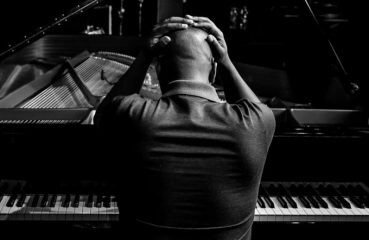 It is tiring having those discussions about a genre and there are a lot of types of Jazz that don’t ‘conform’, and I don’t know where I fit it. It’s music that reflects the time – whether that is musical, political – it’s expressive, emotional music which includes improvisation, which is obviously very personal and part of telling a story of where somebody has come from, where they’re at, or what they believe in. It’s very broad. Music of people. The Tomorrows Warriors organisation (well worth exploring) recently won the Parliamentary Jazz award as Jazz educator of the year for their outstanding working. 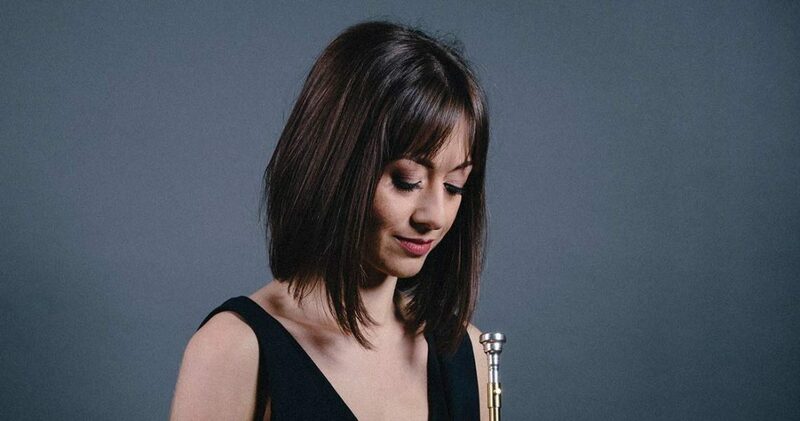 One of the many initiatives they have is a Female Jazz Collective which, focuses on ‘developing girls and young women into strong, confident players and preparing them for careers as professional jazz musicians’. In 2015, they commissioned Yazz to create ‘Polyhymnia’ a piece of six movements celebrating female role models. This was performed by an all-female orchestra at the Women of the World Festival (WOW!) at the South Bank Centre in London and was a huge success. With so many strong female women to choose from, I wouldn’t even know how to begin. Yazz and I discussed how she chose her role models for this piece and how she portrayed them through her music. YA: Well, there were 6 movements, so six women. Malala Yousafzai (Pakistani activist for female education and the youngest Nobel Prize laureate) I studied and transcribed some of the quotes I felt resonated with me from her UN speech. She is such a brave person – it will make you cry. She is an amazing role model and speaker as well. I found the speech at the UN very, well, musical, so I picked a lot of these phrases and made music out of these. There’s lots of chanting in that piece as well. Rosa Parks The music is slightly mathematical. I created a system of notes and rhythms made from the number of the bus she made her protest on. So that piece is quite interesting. It starts out quite calm – thoughtful and reflective to evoke her quiet protest – and then becomes very heavy and angry – the reaction afterwards. Barbara Thompson (MBE who struggled for many years with Parkinson’s disease) I find her very inspiring because she is so strong and determined to perform, even with this awful disease. She has like a window of time when the medicine kicks in where she’d perform – and then she’s totally exhausted for the rest of the day. Real guts and determination to express her art. Ruby Bridges (She was the first African-American child to desegregate the all-white School during the New Orleans school desegregation crisis in 1960) I wrote this in a kind of New Orleans kind of style, but also with twisted dissonance phrases to kind of reflect the moment when she was being shouted out while she was walking to school. But also, she thought she was just an innocent young child – six years old – she didn’t realise what was going on. Haifaa al-Mansour (the first female Saudi Arabian filmmaker) – she’s great. Beautiful films. For that piece, I used Arabic scales and rhythms. Found this one a bit easier to write! Saudi is next to Bahrain, so I went back to my roots again. The Suffragettes I chose one of their protest songs and included some chanting in this one. It was very difficult and such a short timeline as I had to come up with some ideas quite quickly. But it was great to learn about these women in such a short amount of time – a lot of them I didn’t know about until the project came about. I was really grateful to be given that opportunity. Now I know about these women, I want to share their stories with everyone. And I’ve realised that there are a lot of women in history – scientists, mathematicians etc – who have been sort of ignored throughout history. They are not in the history books or just not mentioned as much as they should be, compared to their male counterparts. At this current time, huge steps are being made for women in all industries, not just music, which is hugely encouraging, however, we are still at a time when the news reports ‘the first women to’ and it will be many years before the need to say, ‘the first’, or in fact define gender, goes away. Positive female role models are needed to inspire the younger generation so that they not only believe but actually see that anything is achievable, regardless of gender or cultural background. YA: On a simple level, I hope people enjoy my music and find it intriguing and inspiring. 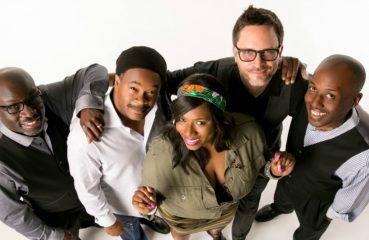 But I also like to give out a subtle message that women can have a role as instrumentalists, not just vocalists in Jazz. So, I guess I’m also sort of challenging people’s perceptions, so women from other backgrounds – the Arabic side of my family are Muslim, and the other side of my family are atheists – so showing people that women from a Muslim background can also be Jazz musicians. I’m challenging people’s perceptions but in a quiet way – you know, I’m not shouting it out – but I hope that people find that inspiring and interesting. When I was growing up, I didn’t have any female role models and I wasn’t aware of any female jazz musicians so I kind of assumed that maybe girls don’t become jazz musicians, except for singers. I hope to inspire the younger generation and to show them that these things are possible. 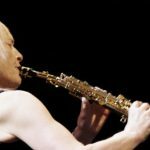 For a woman to become a successful Jazz musician and to hopefully give them encouragement, that they can do this…… So yes, I hope I can help and inspire younger players – or even players my age. I worked really hard to get where I am and I’m still pushing and still working hard. There is absolutely no doubt in my mind that Yazz is a true inspiration to many and exactly the type of role model that we need. An exceptionally talented, inspiring and creative musician who understands the role she can play in today’s society. An artist of the people. Photo Credits: Florence Ducommun, Nadjib Le Fleurier – and (c) info: all rights go to original recording artist/owner/photographer(s).